Hermann Beuchert is the initiator of the Cassalla Guitar Quartet. He studied music, art and guitar performance with J. Wagner, J. Beton and W. Lendle. Besides his engagement with the Cassalla Guitar Quartet, he concertizes with his solo program Obertöne-Klangräume (harmonics-sound compasses) and with the Glasmusik Ensemble Kassel. Anja Gerschewsky was prize-winner of the German "Jugend Musiziert" Music Competition on the national level on more than one occasion and studied with J. Beton and W. Lendle. She is the initiator of the "La Mancha Guitar Ensemble" and performs works for the guitar and other instruments. Jochen Lorbach studied classic guitar with J. Beton, W. Lendle and M. Tröster. He performed with several duo partners and also played at musical productions. Markus Bartke earned his degree in engineering. He taught himself to play the guitar and studied with several teachers. Besides the classic guitar, he plays rock and jazz guitar with several groups. Upalarecords at the publishing house Opal Verlag presents you the Cassalla Guitar Quartet with Hermann Beuchert, Anja Gerschewsky, Jochen Lorbach and Markus Bartke. The Cassalla Guitar Quartet possesses an enormous repertory from the Renaissance to modern times. For this CD, compositions in different styles have been selected - modern music with romantic and folkloristic elements, Klezmer music, minimal music and the adaptations of classic literature by M. Ravel and J. S. Bach. Stephan Rak (*1945) from the Czech Republic is known not only as a guitarist but also as a composer for guitar music. His works include numerous works for solo guitar and for guitar ensembles. His composition "Rumba" is full of chromatic sequences and the rhythm from Central America. The effect of the typical rumba rhythm is enhanced by the beat also being tapped on the corpus of the guitar. Leo Brouwer (*1939) from Cuba is also an accomplished guitar virtuoso as well as a composer, and enriched the modern guitar repertory with distinguished music of his homeland Cuba - including its African roots - and from the European avantgarde music. The program music "Cuban Landscape with Rain" (1984) pictures the atmosphere of an approaching storm - first only a few raindrops, then the rain becoming harder, the thunderstorms erupting over the landscape, and the storm finally subsiding slowly. Francis Kleynjans, born 1951 in Paris, studied classic guitar and composition. His published works - over 600 pieces - are performed throughout the world. Especially his orchestral compositions are earning more and more recognition on the concert stage. In his chamber music compositions, Kleynjans favors his instrument, the guitar. The piece "The Four Seasons" (1991) depicts the repeating cycle of our lives in vivid sound images. As a contemporary American composer and Klezmer musician, Mike Curtis (*1952) has dedicated himself to the Klezmer music. Klezmer is the traditional instrumental music of the Yiddish-speaking Jews from Eastern Europe, and was played on festive occasions, such as wedding ceremonies. The composition "A Klezmer Wedding" is a tribute to this tradition. The piece follows the traditional form: "Doina" - free form, traditionally played at the tables of the wedding guests; "Hora" - a moderate movement in three-fourth meter, interrupted by a fast section; "Chusidl" - in two-fourth meter in the chassida tradition; "Freylach" - a joyful circle dance in moderate to fast two-fourth meter. "Pavane pour une Infante Dèfunte" (1899) by the famous French composer Maurice Ravel (1875-1937) is an impressionistic work. The simple melody unfolds itself over modal chords in parallel motion, which is interrupted by the contrasting middle section with its floating character, then the theme returns with a more agitated accompaniment. This early work by the composer is based on a dance structure with a clear melody line. Celso Machado (*1953) is a multi-talent. He is an exquisite concert guitarist and a singer, as well as a composer. In his compositions, he displays his affinity to music from his homeland Brazil with its rich fundus from the Musica Popular Brasileira. For this CD, three pieces - "Ponteio", "Cantiga" and "Ciranda" - from "Dance Populares Brasileiras" (1988) have been selected, from the numerous opera of the composer, who is currently living in Canada. "Apeiron" (1995) by the German composer Ulli Götte (*1954) has been recorded for the first time on a CD, Götte is very much engaged for the development and propagation of the minimal music. In this process-orientated work in three movements, Götte unfolds his individual polyphonic language with a strong minimal music character. 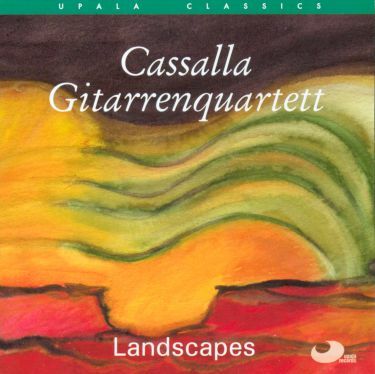 For this CD, the Cassalla Guitar Quartet has selected the "Contrapunctus No. 1 and No. 5" from the 23 movements of the "Art of the Fugue" by J. S. Bach (1685-1750). Since Bach himself has not specified the instruments for the performance of the work, this recording on four guitars can be viewed as an especially fascinating and rare interpretation of the famous work.